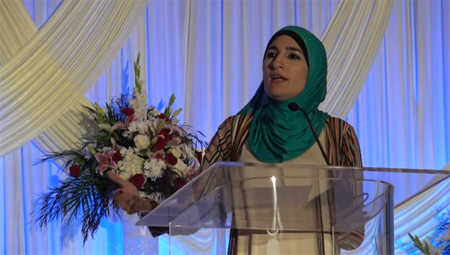 Muslim activist Linda Sarsour called for Jihad on the White House and made a plea for Muslims to refuse to assimilate into America during her keynote speech at the annual convention of the Islamic Society of North America (ISNA) in Chicago last weekend. Sarsour, an Islamic supremacist and anti-Semite, is an outspoken activist within the Muslim community with ties to the terrorist organization Hamas. She was called on to help organize the Women’s March on Washington, D.C. in January and is a strong opponent of President Trump. She also advised attendees to never stop being outraged, and not to “normalize” the Trump administration. During her 22-minute speech she implored participants to divert a portion of contributions they would otherwise give to Muslim organizations overseas to organizations within the United States to help fund Muslim leadership, programs and the next generation of Muslims. “We have enough( mosques) in the this country, we have enough buildings in this country, we have enough bricks in this country, unlimited infrastructure in these United States of America, so I am doing a call-out to you, sisters and brothers, you will not benefit from (mosques)…” she tells the group. Sarsour also made a special appeal for donations to help get Dr. Abdul El-Sayed, a Muslim and Democrat, elected governor of Michigan. She then took the opportunity to attack the “establishment Democrats” who she said blocked Muslims from government positions within the Democratic Party in the past and claimed that El-Sayed would change that. Federal prosecutors have labeled the Islamic Society of North America as part of the U.S. Muslim Brotherhood network that was initially set up to raise funds for the Palestinian terrorist group Hamas. This shouldn’t come as a surprise as many of the speakers at ISNA are extremists and have ties to terrorist networks. In 2001, Anwar al-Awlaki (who later became the leader of Al Qaeda in the Arabian Peninsula), gave a keynote lecture on “tolerance” to ISNA attendees. This year’s featured speaker is Nihad Awad, the executive director of the Council on American-Islamic Relations (CAIR), which is funded by the Muslim Brotherhood. In the past, Awad announced he supported the Palestinian terrorist group Hamas. CAIR was listed by the FBI as having known terrorist ties. Obama reversed that in 2010 and invited the group to the White House. Another featured speaker, Mazen Mokhtar, is the current executive director of the Muslim American Society (MAS). He was once identified in an affidavit as the man behind a website to solicit funds for the Taliban and Chechen mujahedin. Sarsour comes with her own baggage, which the Democratic Party has overlooked, considering in 2011 then-President Obama honored her at the White House as a “Champion of Change.” In fact, Sarsour was invited to seven meetings with the Obama administration. She has been very vocal about her support for Palestine and hatred for Israel, and avidly supports the Boycott, Divestment & Sanctions (BDS) movement, which is a Hamas-inspired initiative that uses public protest, economic pressure, and lawsuits to advance Hamas’ agenda of permanently destroying Israel as a Jewish nation-state. The BDS has also taken root in American colleges and universities, fueling the anti-Semitic rhetoric on campuses. In 2004, Sarsour conceded that a friend of hers as well as a cousin were both serving long sentences in Israeli jails because of their efforts to recruit jihadists to murder Jews. At the same time, she revealed her brother-in-law was serving a 12-year prison term because of his affiliation with Hamas. As if that’s not enough to question her intentions, Sarsour’s “mentor, motivator, and encourager,” Siraj Wahhaj, was listed as an unindicted conspirator in the 1993 World Trade Center bombings. Check out “Democrats ‘Useful Idiots’ as Islam Seeps into America” for more indepth information and excellent videos. Muslims are working their plan to take over America and Europe. They will tell you with their own words, show you with their actions. You just have to listen to what they’re saying and watch what they’re doing. Linda Sarsour is a danger to America.